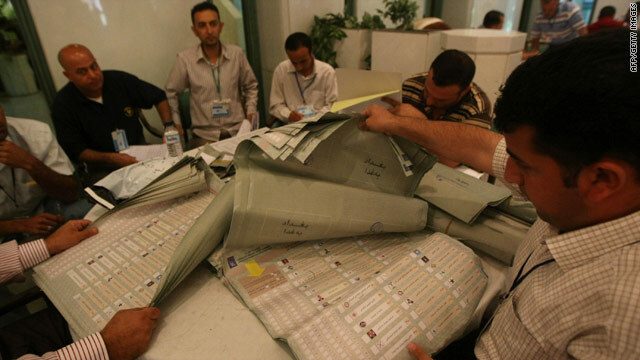 Workers recount ballots May 7 in Baghdad, Iraq. Officials said Sunday the results were unchanged in Iraq's largest province. Baghdad, Iraq (CNN) -- A recount of votes in the Iraqi election found no change in seat allocation for any of the blocs in the most populous province, Baghdad, officials said Sunday. That is a blow to Prime Minister Nuri al-Maliki, who claimed there was election fraud and won a court appeal for the recount after his coalition came in second by two seats. Many international observers, however, described the March 7 elections as fair. Saad al-Rawi, commissioner of the Independent High Electoral Commission, said the recount of Baghdad votes has been completed. The province is allowed 68 seats out of 325 in Iraq's parliament. Qassim Al-Aboudi, another IHEC commissioner, told reporters Sunday there was a minor difference in the number of votes, but not enough to affect the results for Baghdad province. It did not exceed 3,000 votes, he said. More than two months after the balloting, there has been no clear winner, and the final results in each of Iraq's 18 provinces need to be certified in federal court before the parliament can be seated. Former Prime Minister Ayad Allawi's mainly secular al-Iraqia won a narrow victory with 91 seats, while al-Maliki's predominantly Shiite State of Law coalition won 89. To form a government, a 163-seat majority is needed. Critics of al-Maliki say he has been wrangling to chip away at Allawi's lead by pursuing the recount and forming a coalition with the rival Iraqi National Alliance, a coalition of Shiite parties. That merger would form a bloc with 159 seats, four seats away from having the majority they would need to form a government. Iraq has been torn by Shiite and Sunni tensions for years. And the re-emergence of a united Shiite alliance, the same one that has ruled the country since 2005, could stoke sectarian tensions, especially if the Sunni Arab minority feels that it is not being represented. Allawi's bloc, meanwhile, has had much support from the Sunni community. Western and Iraqi officials, including Allawi, have said that Iraq's next government must be inclusive and representative or the consequence may be violence. Sunni Arabs largely boycotted the 2005 elections, leading to a Shiite-led government which left the once-ruling Sunni minority feeling alienated. That was a factor driving some Sunnis into a bloody insurgency and a sectarian war that gripped Iraq for years. Extremist groups, mainly al Qaeda in Iraq, are known to take advantage of political fissures and carry out attacks to create further turmoil. The U.S. military is scheduled to draw down its troops, leaving behind a residual force of about 50,000 with a non-combat mission by the end of August. According to the security agreement between the two countries, all American troops are scheduled to be out of Iraq by the end of next year.